Rayzo Ban lifted, Final chance. - Regen / Battle suit modified for a better balanced gameplay. - Callvote Map enabled, ( usage /callvote map ) to see full list then add the desired map to vote on , example /callvote map q3dm8. 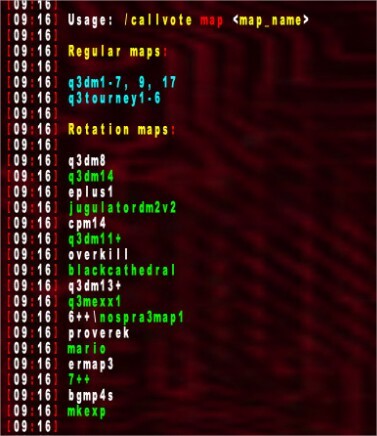 The list also shows the rotation sequence. 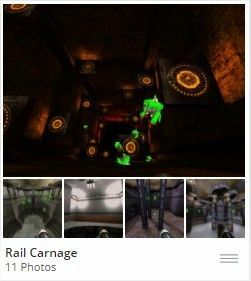 Excessive Plus (E+) is an “over-the-top” Quake III (Q3) and OpenArena (OA) Modification (Mod) that is often played with super-powerful weapons, no self-damage, regenerating health and ammo, multi-jumps and the awesome ability to move rapidly around a map via the power of your weapon. E+ is based on a fully customizable scripting engine with which to create your own server game style and settings. You can modify the frame-rate independent physics, create complex “if / else” constructs for the map rotation/crontab/callvote files, and create completely new or additive map entity files to change the spawn, ammo, items, and power-up placements on any map. You can speed up the game, slow it down, set 0 to 12 multi-jumps, modify the rate of weapons fire/reload/cycling, modify weapons damage, recoil, power-ups strengths, and many more options. This power allows you to take E+ in many directions or precisely replicate the game style of baseoa, defrag, cpma, etc. Consequently, when some players say they don’t like E+, they are really saying they do not like one or more game styles out of numerous possibilities. E+ can be played server-side only (that is, download of the Mod is not necessary to play) or client-side (by downloading the full Mod). It was created in 2001 but was not released until later. The Mod is based on Dan “Mr. Pants” Schoenblum’s Q3 Excessive Mod which has spawned “Excessive Mods” for other games such as Unreal Tournament/UT2003/UT2004/UT3, Star Trek Voyager: Elite Force and BattleField Vietnam. E+ utilizes unlagged technology from the Unlagged Mod, and various features from the CPMA, Freeze/uFreeze, InstaGib, and OSP Mods. It began to gain popularity in 2003 and was one of the most popular Q3 and OA Mods for many years. 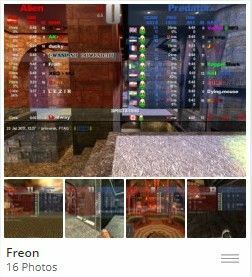 Significantly, it is compatible with IoQuake3, OpenArena, Quake III Arena/Team Arena, Xreal (2009 version), and may be compatible with other Open Source versions of the Q3 engine. Excessive Plus is the fastest, most explosive 3D Action/Shooter (FPS) Mod in the world. It works with Quake III, IoQuake3, OpenArena and Xreal.